I had an urge to make cookies, so I did 🙂 This is a nice chewy cookie made with half white flour and half oat flour. 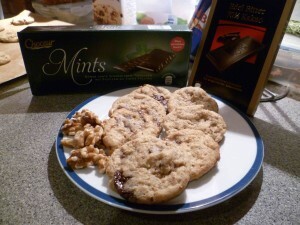 Tonight I added some no-name brand thin mints (like After-Eight), walnuts and chunks of 70% dark chocolate. Yummy! Preheat oven to 375F. Grease cookie sheets (or use parchment paper). Grind oats in food processor to powder and set aside. Sift together flour, baking powder, baking soda, salt together and set aside. Cream butter and sugars in mixer until light & fluffy. Add egg and vanilla. Add dry ingredients to batter and beat until well blended. Stir in chocolate, nuts, mint wafers. Make 1 1/2 inch balls of dough and place on sheets. space about 2 1/2 inches apart. Flatten slightly. Bake 8 to 10 minutes or until just tinged with brown at the edges. Remove and let cool on sheets for 3 to 4 minutes. Remove with spatula to wire rack to cool completely. Makes 30 to 50 depending on how you measure. 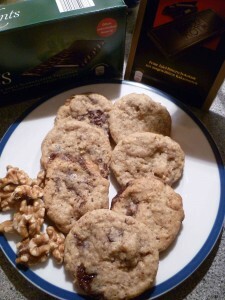 This is also the same recipe we use for making Chocolate Chip cookies. 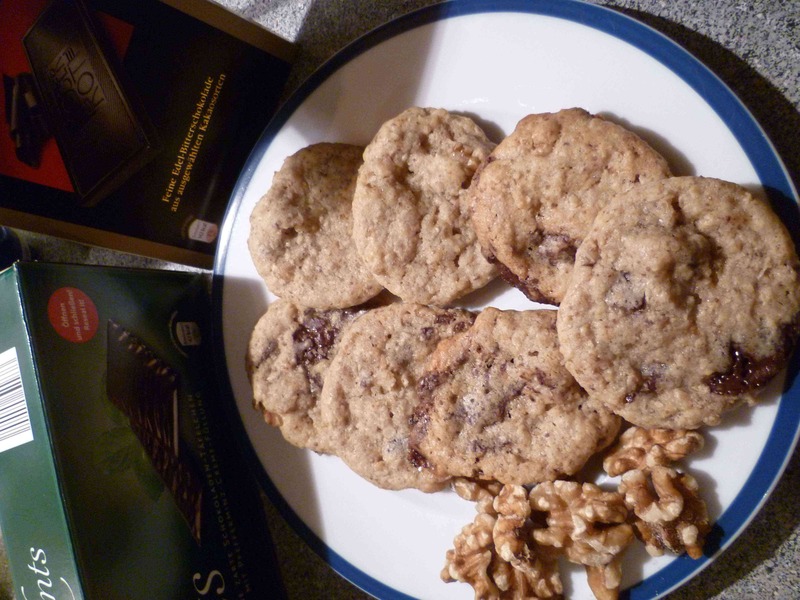 We find it is way better than the typical “Toll House Cookie” recipe.